SAN FRANCISCO — The Nichi Bei Foundation Presents the fifth annual Films of Remembrance on Saturday, Feb. 20, from 10:30 a.m. to 8 p.m. at New People Cinema, 1746 Post St. in San Francisco’s Japantown. This one-day film event commemorates the signing of Executive Order 9066, which set the wheels in motion to forcibly remove some 120,000 persons of Japanese ancestry into American concentration camps during World War II. Filmmakers reception from 8 to 10 p.m. featuring Okinawan music by Lucy Nagamine and Naoko Nishimata with support from Berkeley Genyukai, as well as a cappella music by the Nikkei Choral Ensemble of UC Berkeley. Food and beverages catered by Nakayoshi Young Professionals. This year’s lineup includes a heartwarming film on a Nisei Military Intelligence Service veteran who traveled back to Japan 70 years later to meet one of 1,500 Okinawans he helped to save during the Battle of Okinawa. Also screening is a film on the experience of Japanese Americans incarcerated out of Alaska and how the local community supported them, a film on the little-known citizen isolation centers, and the event’s anchor film on the historic Japanese American redress movement. Also screening during a series of shorts entitled “Re-creating Nikkei History” is a film on civil rights leader Sei Fujii starring Chris Tashima (Academy Award-winning director of “Visas and Virtue”), who will join the post-film discussion, as well as an experimental piece on the killing of a camp inmate. 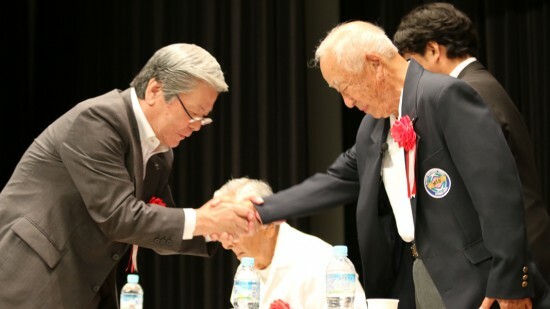 “Films of Remembrance was designed to provide a venue for filmmakers to showcase their work on the wartime forced removal and incarceration of Japanese Americans in American concentration camps, to provide deeper understanding so that such deprivation of civil liberties would never happen again,” said Kenji G. Taguma, president of the Nichi Bei Foundation. Filmmaker Gena Hamamoto, the assistant director of the UCLA Asian American Studies Center’s Department of EthnoCommunications, will present “Building History 3.0: Learning about Japanese American Incarceration Camps Through Minecraft” as well as her short film “Typhoon of Steel,” which documents the role of Japanese American soldiers caught between two cultures in the Battle of Okinawa. All filmmakers are expected to be represented, with Prof. Art Hansen, director emeritus of the CSU Fullerton Japanese American Oral History Program, providing additional historical insight for some films. “Typhoon of Steel” (2012, 19 min.) by Gena Hamamoto is a short community-based documentary that explores the lives of two Okinawan American Kibei Nisei who served in the U.S. military as linguists in the Battle of Okinawa during World War II. While Japanese Americans on the West Coast were incarcerated in American concentration camps, these men risked their lives to prove their loyalty to America. Born in the U.S. and raised in Okinawa, their cultural and linguistic skills were a tactical asset to the military. But emotions ran high as they saved their own families, and witnessed civilian casualties and the devastation of the island they once called home. “The Herbert Yanamura Story” (2015, 25 min.) by Alexander Bocchieri and Stacey Hayashi is a documentary that chronicles Herbert Yanamura’s journey as a young soldier trying to make a difference, and the amazing rendezvous nearly 70 years after the Battle of Okinawa with someone who heeded his call. Of the 250,000 people who died on Okinawa during the battle, nearly 150,000 were civilians. Tragically, thousands committed suicide. Yanamura, a Japanese American soldier and linguist with the Military Intelligence Service, issued a compassionate, stirring call to the civilian population to surrender. His actions on June 21, 1945 helped save the lives of over 1,500 civilians, including many women and children. For many years, this modest, unassuming hero of the Greatest Generation wasn’t permitted to talk about his work with the MIS. Now, in his own words, he shares the fascinating, unheralded history and hidden human element behind this major World war II battle. “Building History 3.0: Learning about Japanese American Incarceration Camps Through Minecraft” by UCLA Department of EthnoCommunications. A joint effort of Oscar-nominated filmmaker and educator Renee Tajima‐Peña and game‐based learning designer Randall Fujimoto, “Building History 3.0” is originated by and designed for youth. It was inspired by Tajima-Peña’s 12‐year‐old son Gabriel, who constructed a virtual Heart Mountain concentration camp using Minecraft during a visit to the Heart Mountain Interpretive Center. “Building History 3.0” will be an online, game-based curriculum that can be taught in a variety of settings, including schools, community and cultural institutions, and at home. The curriculum will be developed in accordance with national and state Common Core Standards. “Warning Shot: The Killing of James Wakasa” (12:40 min, 2015) by Tina Takemoto, One death. Three versions of the crime. 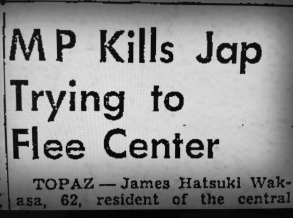 James Wakasa, a 63-year-old Japanese American bachelor, was shot to death by military police at Topaz incarceration camp during World War II. Was it justifiable homicide, an accidental fatality, or second-degree murder? This queer experimental film essay uses the “Rashomon effect” to juxtapose the conflicting accounts regarding the circumstances and cause of Wakasa’s untimely death. “Lil Tokyo Reporter” (30 min., 2012) by Jeffrey Gee Chin, a narrative short film based on the true life struggles of Sei Fujii, an immigrant pioneer, civil rights leader, and publisher of the Kashu Mainichi community newspaper who protected the livelihood of the Japanese American community from 1903 to 1954. The film stars Chris Tashima, Eijiro Ozaki, Ikuma Ando, Keiko Agena and Sewell Whitney. Screenplay written by Guinevere Turner (“American Psycho”), based on the research of executive producer Fumiko Carole Fujita and the Little Tokyo Historical Society. Interviews of professors, artists, former prisoners and archival and present-day photographs bring this piece of U.S. history to life. When the citizen isolation centers are closed, the men are not freed, but are sent into the Stockade, a prison within a prison, at what then became the Tule Lake Segregation Center in 1943. The Stockade is compared to Abu Ghraib by Professor Roger Daniels, as he talks about the beatings with baseball bats and other major mistreatment of any men who dared to ask questions, or wished to “renounce” their American citizenship, quite often as a sign of protest for their treatment by these authorities. 4 p.m.: “The Empty Chair” (2014, 72 min.) by Greg Chaney, a unique documentary about how Japanese Americans from Juneau, Alaska were sent to prison camps during World War II and how the small Alaskan community stood in quiet defiance against the immoral incarceration of American citizens. Japanese immigrants came to Alaska in the early 1900s and settled there to raise families. John Tanaka was born and raised in Juneau. In 1942 he was going to be the valedictorian of his high school graduating class but was scheduled to be incarcerated in an American before the graduation ceremony. In response, the school board voted to hold a special early graduation ceremony for him before he was sent to the camp. When the official graduation ceremony was held for the Class of ’42, they set aside an empty chair on the platform to acknowledge his absence. Tanaka volunteered to join the U.S. Army to fight the Axis powers while the rest of his family was incarcerated. He was a member of the all-Japanese American 442nd Regimental Combat Team, the most decorated Army unit for its size and length of service. “The Empty Chair” is composed of interviews of survivors from that period, rare historical photos, never-before-seen archival footage, U.S. government documentaries and historical accounts. All of these sources are woven together to draw the viewer back into this little-known chapter of American history. 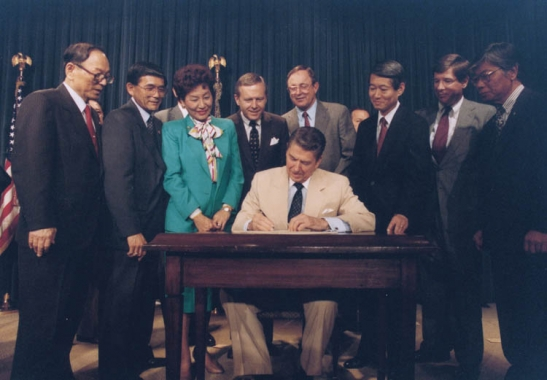 President Ronald Reagan signs the redress bill into law on Aug. 10, 1988. The Civil Liberties Act of 1988, almost 45 years in the making, acknowledged the fundamental injustice of the imprisonment of Japanese Americans during World War II in American concentration camps and paid each surviving incarceree $20,000 along with a government apology. Not many outside the Japanese American community know this story. “Right of Passage” recounts the journey of a small disenfranchised people who for 30 years buried their shame and indignation but then found the courage and strength to seek justice, which then snowballed into a lesson of the power of American democracy. The documentary draws upon newly declassified documents, never-before-seen archival films and interviews with players speaking for the first time. Featured are Presidents Ronald Reagan, Jimmy Carter and Gerald Ford; Sens. Daniel Inouye, Spark Matsunaga and Alan Simpson; Reps. Barney Frank, Norman Mineta and Robert Matsui; Ken Duberstein, former chief of staff to Reagan; and the men and women from the community who played a significant role in this Herculean effort.